For other uses, see Zedd (disambiguation). Anton Zaslavski (Russian: Антон Заславский;[a] born 2 September 1989), known professionally as Zedd (/ˈzɛd/), is a Russian-German record producer, DJ, multi-instrumentalist and songwriter. He primarily produces and performs electro house music, but has diversified his genre and musical style, drawing influences from progressive house, dubstep, and classical music. Anton Zaslavski was born on September 2, 1989 in Saratov, Russia. He grew up in Kaiserslautern, after his family moved to Germany when Anton was three years old. He is a classically trained musician, the son of two musicians. His father, Igor Zaslavski, is a guitarist and schoolteacher, and his mother is a piano teacher. He began playing the piano at the age of four and drums at twelve years old. He has an older brother, Arkadi and a younger brother, Daniel. In 2002, Zaslavski began playing for the German deathcore band Dioramic, signed by Lifeforce Records. Zaslavski's interest in producing electronic music was piqued after hearing Cross by the French electronic duo Justice. 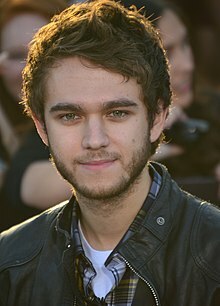 After leaving Dioramic in 2010, Zedd won two Beatport remix contests in 2010; his first original release, "The Anthem", entered the Beatport Electro house chart in the top 20. His remix of Skrillex's "Scary Monsters and Nice Sprites" also entered the Beatport Electro House chart, peaking at number 2. He has since produced remixes of well-known artists, including Justin Bieber, Lady Gaga, the Black Eyed Peas, Periphery and others. Zaslavski creates his music using the Cubase suite of music production applications, and uses plug-ins such as the Sylenth1, Nexus, SynthMaster 2.6, and Omnisphere synthesizers, and the Kontakt sampler. In 2011, Zedd's remix of Lady Gaga's track "Born This Way" appeared on the special edition of her third studio album, Born This Way (2011). In 2011, his single "Shave It Up" (then known as "Shave It") became Zedd's first release on OWSLA. Zedd went on to release "Slam the Door" and "Shotgun" with OWSLA before departing to release his debut album in 2013. In 2012, Zedd signed with Interscope Records and released his debut single from the label, "Spectrum", with vocals by Matthew Koma. It shot to the top of Billboard's Hot Dance Club Songs. He then produced the Eva Simons song, "I Don't Like You", which was also released on Interscope. He also produced and co-wrote the third single "Beauty and a Beat" with Max Martin for Justin Bieber's third studio album, Believe. On 12 October 2012, Zedd released his debut studio album, Clarity, with "Spectrum" as the album's lead single. "Clarity", featuring British singer-songwriter Foxes, was released on 1 February 2013 as the album's third single. It charted in the top 10 of Billboard Hot 100, sold 2,238,000 copies, and was certified platinum, making it Zedd's most successful single to date. The song also became the #1 most played on American radio on 10 September 2013. Zedd concluded 2013 with his first worldwide tour, selling out venues across 5 continents. Zedd worked with Japanese singer Namie Amuro and produced her promotional single, "Heaven" for her album Feel. Zedd would later work with her again in 2015 for her album, genic, although none of his songs were actually featured on the album. "Stay the Night", featuring Hayley Williams, was released as a single on 10 September 2013, as part of the deluxe version of Zedd's album. The song met similar success, although it was criticized for its lack of uniqueness and less powerful lyrics compared to "Clarity". It ranked in Billboard Hot 100's top 20, and certified platinum as well. In 2013, Zedd produced "Aura", "G.U.Y. ", and "Donatella" on Lady Gaga's 2013 album, Artpop. On 26 January 2014, he released the single "Find You" featuring Matthew Koma and Miriam Bryant, which is included on the soundtrack for the film Divergent. On 3 July 2014, Ariana Grande released a song with Zedd entitled "Break Free", which peaked at No. 4 on the Billboard Hot 100 and peaked at No. 1 on the Hot Dance/Electronic Songs. The song was nominated at the Teen Choice Awards in the category of "Break-Up Song". On 18 December 2014, Moment of Clarity, a documentary about Zedd and his 2013 world tour, was released through his YouTube channel, with Sandra Bullock, Rachel Weisz and Julia Roberts. After taking a six-month break, Zedd announced the release of his second studio album, True Colors. On 23 February 2015, Zedd released his collaboration featuring Selena Gomez, "I Want You to Know". The song was co-written by Zedd, Ryan Tedder of OneRepublic, and Kevin Drew. The song was nominated for "Choice Party Song" at the Teen Choice Awards and made it to #1 on Billboard's Dance/Electronic Songs and peaked at number 17 on Billboard Hot 100. The song was certified platinum in the US for selling over one million copies. Zedd released his second single, "Beautiful Now" featuring Jon Bellion, on 13 May 2015. The album, True Colors, was released two days later. The album peaked at number 1 on Billboard's Dance/Electronic Albums, and has ranked at other various international charts. The third single from the album, "Papercut", featuring Troye Sivan, was released on 17 July 2015. On 22–23 May, he headlined the Counter Point Music and Arts Festival along with The Roots and Widespread Panic. Along with Eric Prydz, Zedd headlined the first day of 2015 Spring Awakening Festival. Zedd performed at the 2015 CMT Music Awards with Lady Antebellum. Together, they performed mashup of their songs "Long Stretch of Love" and "Beautiful Now." His second world tour, the True Colors Tour, ran from August to November 2015 and visited Asia, North America and Europe. Zedd was included in the line-up for Coachella 2016. In 2017 he organized a benefit concert for the American Civil Liberties Union, prompted in response to US President Donald Trump's executive order to "suspended all refugee admissions for 120 days and blocked citizens of seven Muslim-majority countries, refugees or otherwise". The line-up included Daya, Halsey, Macklemore, Tinashe and Skrillex. On 26 February 2016, Zedd released the single "Candyman" alongside Aloe Blacc. On 15 July 2016, singer Hailee Steinfeld and producer duo Grey released a song featuring Zedd titled "Starving", which peaked at No. 5 on the Billboard Mainstream Top 40 and No. 5 on the UK Singles Chart. Zedd released a collaboration with Riot Games for the 2016 League of Legends eSports championship, Worlds, titled "Ignite" on 26 September 2016. He followed up the release of the song with a "Finals Remix" a month later. On 15 December 2016, Zedd released a remix of DJ Snake's hit song "Let Me Love You". On 23 February 2017, Zedd released his collaboration along with Alessia Cara, "Stay" which debuted at number 28 on the Billboard Hot 100 and 33 on the UK Singles Chart. On 6 July 2017, Zedd released his single with Liam Payne, "Get Low". In March 2018, Billboard named Zedd as number seven on their 2018 ranking of dance musicians titled Billboard Dance 100. Zedd was tapped by National Geographic to make a song inspired by the documentary series One Strange Rock and released a video to the song, also titled "One Strange Rock" on his YouTube channel on 9 April 2018. On 17 July 2018, Zedd released his single with Elley Duhé, "Happy Now". The accompanying music video was later released 23 August 2018. On 27 September 2018, Zedd released his remix of the Shawn Mendes single "Lost in Japan". This single quickly rose onto the Top 40 charts and was the first collaboration between the two artists. They performed this song at the 2018 American Music Awards on October 10, 2018 and then performed it again at the Victoria's Secret Fashion Show on November 8, 2018. The accompanying music video was released following both performances on 9 November 2018. On 14 February 2019, Zedd released his collaboration with Katy Perry, "365", along with the song's music video directed by Warren Fu. Linkin Park and Friends – Celebrate Life in Honor of Chester Bennington (2017) – drums on "Crawling"
^ tr. Anton Zaslavskij, pronounced [ɐnˈton zɐsˈɫafskʲɪj]. ^ "Zedd on Twitter: "I don't have a middle name lol"". Twitter. Retrieved 24 February 2018. ^ a b Heaney, Gregory. "Allmusic: Zedd (biography)". AllMusic. Rovi Corporation. Retrieved 1 September 2013. ^ Dolan, Jon (8 May 2013). "Zedd, Clarity". Rolling Stone. Retrieved 28 June 2014. ^ "Biography". zedd.net (Official site). Retrieved 9 November 2014. ^ "Zedd: Information". DJ List. ^ O'Malley Greenburg, Zach (14 August 2013). "Zedd Ahead: Meet The Next Big Star Of Electronic Music". Forbes. Retrieved 12 December 2015. ^ "ELR™ Exclusive Interview w/ Zedd". Easyloverecords.com. 19 November 2010. Retrieved 7 November 2012. ^ "Zedd – Biography | Billboard". www.billboard.com. Retrieved 28 October 2016. ^ "Why did you choose the name Zedd?". Zedd. Retrieved 3 April 2018. ^ "Zedd & Cedric Gervais Take Home First Grammys". Billboard. 26 January 2014. Retrieved 30 January 2014. ^ "Zedd on Twitter". Twitter. Retrieved 28 October 2016. ^ a b O'Malley Greenburg, Zack (14 August 2013). "Zedd Ahead: Meet The Next Big Star Of Electronic Music". Forbes. Retrieved 10 October 2018. ^ a b "Watch Zedd Playing Music As A Child, Along With His Brother And Father". EDM.com. 21 February 2014. Retrieved 26 June 2015. ^ "Zedd Exclusive Interview". The Worst Guy. 23 December 2011. Retrieved 7 November 2012. ^ "Zedd – 'The important point of the actual music is being neglected a bit'". Upcoming-Soon. 5 June 2011. Archived from the original on 13 March 2013. Retrieved 7 November 2012. ^ "An Early Christmas Gift! An Interview with Zedd". 310electro.com. Retrieved 7 November 2012. ^ Brown, Hayley (23 July 2014). "Beatport's New President Lloyd Starr on Download Farms, What EDM Even Is". Billboard. Retrieved 7 August 2014. ^ "Zedd – May 2010 Chart". pro.beatport.com. Retrieved 25 August 2015. ^ Lee, Christina (2 August 2014). "MAGIC! 's "Rude" Gets Remixed By Zedd At Lollapalooza". Idolator. Retrieved 7 August 2014. ^ Abascal, Lina (1 December 2012). "In The Studio With Zedd: Going for Clarity". DJ Times. Retrieved 7 August 2014. ^ Daw, Robbie (21 October 2011). "Lady Gaga's 'Born This Way: The Remix' & 'The Collection' Covers Revealed". Idolator. Retrieved 7 August 2014. ^ "Zedd Bio, Music, News & Shows". DJZ.com. Archived from the original on 30 March 2013. Retrieved 11 March 2013. ^ "Dance/Club Play Songs – Week of 1 September 2012". Billboard. Prometheus Global Media. 13 October 2012. ^ Vena, Jocelyn. "Justin Bieber Didn't 'Convince' 'Beauty And A Beat' Producer Zedd At First". MTV. Retrieved 19 November 2013. ^ "Zedd's 'Clarity' Finally Hits #1 On US Radio". EDMTunes. Retrieved 21 August 2015. ^ "Zedd – Moment Of Clarity World Tour". www.momentofclaritytour.com. Retrieved 20 August 2015. ^ "安室奈美恵 NEW ALBUM「_genic」 SPECIAL WEBSITE". ^ Genic (Album liner notes) (in Japanese). Tokyo, Japan: Avex Trax. 10 June 2015. ^ Shotwell, James. "Zedd Streams "Stay the Night" Featuring Hayley Williams of Paramore". Under The Gun Review. Spin Media. Retrieved 18 October 2013. ^ "Zedd Announces 'Moment of Clarity' Documentary Release for 18 December". Retrieved 20 August 2015. ^ "Lady Gaga Has 'A Lot Of Work Left' On ARTPOP Songs". MTV. Retrieved 21 June 2013. ^ Rigby, Sam (18 March 2014). "Zedd premieres Divergent music video for 'Find You'". Digital Spy. Retrieved 7 August 2014. ^ Lipshutz, Jason (23 June 2014). "Ariana Grande's 'Break Free': Zedd Discusses The 'Problem' Follow-Up". Billboard. Retrieved 28 July 2014. ^ Trust, Gary. "Ariana Grande, Iggy Azalea Triple Up In Hot 100's Top 10, MAGIC! Still No. 1". Billboard. Retrieved 20 August 2014. ^ "2014 Teen Choice Awards Nominees Announced". PopCrush. Retrieved 11 November 2015. ^ "Zedd-Moment of Clarity (Documentary)". Youtube. Retrieved 20 August 2015. ^ "Zedd And Selena Gomez Release Highly Anticipated Single I Want You To Know". ^ ""Selena did a bang-up job. She killed it," says Tedder of the hotly anticipated new track". Billboard. 8 February 2015. ^ "Written-By". Discogs. Retrieved 25 December 2015. ^ "Zedd – Chart history | Billboard". billboard.com. Retrieved 21 August 2015. ^ "Zedd Announces Album Release May 15, 2015. Date". wegotthiscovered.com. Retrieved 11 November 2015. ^ "Zedd – Chart History: Dance/Electronic Albums". Billboard. Retrieved 20 August 2015. ^ "Zedd-Papercut (featuring Troye Sivan)". Youtube. Retrieved 20 August 2015. ^ "Counterpoint music and art festival announces line-up widespread panic and zedd headlining". 15 January 2015. Retrieved 22 August 2015. ^ "Spring Awakening Festival Announces 2015 Lineup: Zedd, Hardwell, Tiësto & More (Exclusive)". Retrieved 22 August 2015. ^ "Long Stretch of Love/Beautiful Now". cmt.com. Retrieved 11 November 2015. ^ "True Colors Tour | Zedd". Retrieved 21 August 2015. ^ "Coachella". Coachella. Retrieved 12 January 2016. ^ "Zedd's ACLU Benefit Concert to Feature Skrillex, Incubus, Macklemore & More". billboard.com. Retrieved 2 June 2017. ^ "Zedd Organizes 'Welcome' Concert to Benefit ACLU". radio.com. Retrieved 2 June 2017. ^ Meadow, Matthew (2 February 2017). "Zedd Drops Stacked Lineup With Skrillex, Halsey, Macklemore & More For ACLU Benefit Concert". youredm.com. Retrieved 2 June 2017. ^ "Hear Zedd & Aloe Blacc's Wonka-Factory-Worthy 'Candyman' Remake". Billboard. Retrieved 7 April 2017. ^ "Hailee Steinfeld Tastes Love With Zedd & Grey on 'Starving'". Billboard. Retrieved 7 April 2017. ^ "Hot 100 Chart Moves: Hailee Steinfeld's 'Starving' Hits the Top 40". Billboard. Retrieved 7 April 2017. ^ "HAILEE STEINFELD/GREY/ZEDD | full Official Chart History | Official Charts Company". www.officialcharts.com. Retrieved 7 April 2017. ^ Stevo (28 September 2016). "Zedd Releases 'Ignite' For The League of Legends Theme Song". EDM Sauce. Retrieved 7 April 2017. ^ Rubinstein, Peter (30 October 2016). "Watch Zedd Perform His League Of Legends Anthem Live With Insane Hologram Visuals [VIDEO]". Your EDM. Retrieved 7 April 2017. ^ "Alessia Cara and Zedd's New Single "Stay" Is Finally Here". Retrieved 23 February 2017. ^ Liam Payne, Zedd invite you to 'Get Low' in catchy summer anthem. ^ "Zedd, Maren Morris & Grey's 'The Middle' Hits No. 1 on Pop Songs Airplay Chart". Billboard. Retrieved 20 April 2018. ^ "The Chainsmokers named top DJs in the world by Billboard". WJBD Radio. Retrieved 23 March 2018. ^ Bein, Kat (6 April 2018). "Zedd Lets Fans Inside His Head While Creating Song Inspired By 'One Strange Rock' National Geographic Series: Watch". Billboard. Archived from the original on 24 May 2018. Retrieved 30 May 2018. ^ Spanos, Britney. "Hear Zedd's Glitchy Remix of Shawn Mendes' 'Lost in Japan'". Rolling Stone. 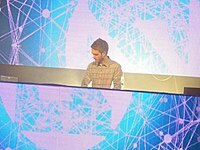 Wikimedia Commons has media related to Zedd.